This stunning feature was first documented by the Facebook group Alberta Aurora Chasers last year. Awareness of the object, in conjunction with the powers of social media, have now resulted in more than 50 observer reports. This ribbon of purple and green light is unlike any other known auroral feature and we’re still not sure what causes it. The Alberta Aurora Chasers decided to call it Steve in honor of the children’s movie Over the Hedge, in which a character arbitrarily conjures up the name Steve to describe an object he’s not sure about. The work of these citizen scientists has attracted the attention of space scientists from NASA, the ESA, and University of Calgary, who are now actively trying to figure out what this transient object really is. 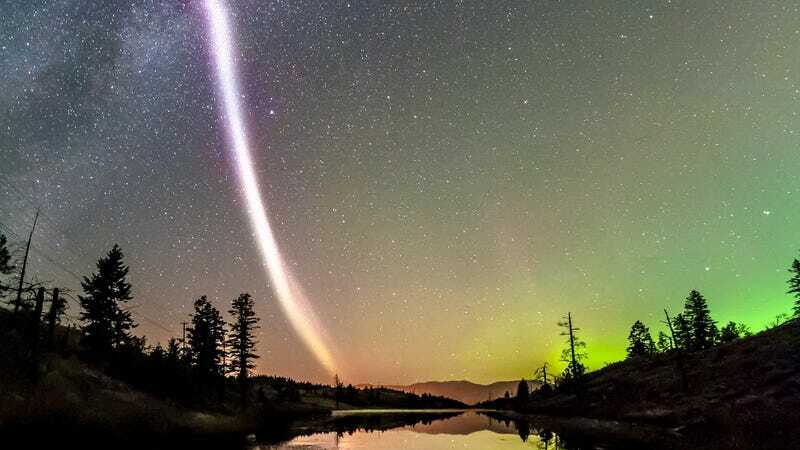 There’s even been a push to turn Steve into an acronym meaning “Strong Thermal Emission Velocity Enhancement”—a description based on preliminary satellite observations. As noted at the Aurorasaurus blog, a picture of this feature is starting to emerge. We know that Steve is a 25 to 30 kilometer (15 to 18 miles) wide arc that aligns east-west, and extends for hundreds, possibly thousands, of miles. It can last for as long as an hour or more, and it appears to be seasonal, disappearing from October to February. It emits light in mostly purple-ish colors, and is often accompanied by green and short-lived “picket fence” structures. It appears in the northern hemisphere along latitudes similar to Calgary, Alberta. At first, the citizen scientists figured it was some kind of proton arc, but proton aurorae aren’t visible to the naked eye, so it has to be something else. 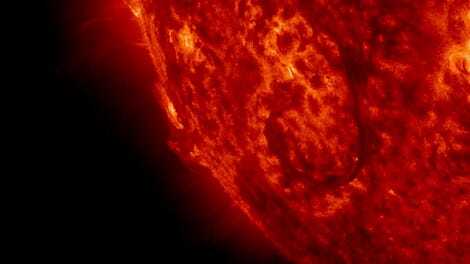 Eric Donovan, an associate professor in the Department of Physics and Astronomy at the University of Calgary, has taken an interest in the feature, and is using data collected by the ESA’s Swarm magnetic field mission to learn more about it. Swarm uses a trio of satellites to take high-precision and high-resolution measurements of the strength, direction, and changes in the Earth’s magnetic field, which are responsible for triggering auroras. These spectacular features are caused by collisions between electrically-charged particles from the Sun that enter the Earth’s atmosphere and collide with gases like oxygen and nitrogen. Wait, full stop. A temperature spike of 3,000 degrees?! That didn’t seem right, so we contacted Donovan directly for confirmation. “The temperature spike number is correct,” he told Gizmodo. Whoa. Okay, then. We also asked Donovan if he knows what causes the feature. Donovan said that a surprising aspect of Steve is how frequently it appears. It’s been under our noses for quite some time, but we’re only now recognizing it as a distinct atmospheric phenomenon. It has an unusual spectral mix, so the color looks “off” compared to normal aurora. Exciting! We asked Donovan to give us the head’s up when his new paper is ready for prime time.